Background and objectives: Extended-interval dosing of epoetin alfa (EPO) is commonly used to treat anemia in patients with chronic kidney disease (CKD). This study aimed to demonstrate that EPO dosed every 2 weeks (Q2W) and every 4 weeks (Q4W) was noninferior to once-weekly (QW) dosing. Design, setting, participants, & measurements: 430 anemic subjects with stage 3 to 4 CKD receiving a stable QW dose of EPO were randomized 1:1:2 to QW, Q2W, and Q4W dosing for 36 weeks. Hemoglobin (Hb) was measured weekly, and the dose of EPO was adjusted to maintain an Hb level of 11.0 to 11.9 g/dl. The primary endpoint was change in Hb from baseline to the average of the last 12 weeks of treatment. Results: Both the Q2W and Q4W dosing groups were noninferior to the QW group. The estimated difference of the mean change in Hb between Q2W and QW was −0.03 g/dl; and between Q4W and QW was −0.09 g/dl. From weeks 13 to 37, the mean percentage of weeks per subject with Hb 10.0 to 11.9 g/dl, inclusive, was 81% for QW, 81% for Q2W, and 75% for Q4W. Death occurred, respectively, in 4%, 3%, and 4%; thromboembolic vascular events occurred in 3%, 5%, and 3%; and serious adverse events occurred in 22%, 26%, and 26% of subjects. Conclusions: Q2W and Q4W EPO dosing maintained Hb levels in subjects with stage 3 to 4 CKD. Deaths, thromboembolic vascular events, and serious adverse events were comparable across the dosing groups. Chronic kidney disease (CKD) affects more than 25 million adults in the United States (1), with many developing anemia due to diminished erythropoietin production by the kidneys (2). Anemia of CKD is associated with decreased oxygen delivery and utilization, leading to weakness, fatigue, and frailty with increases in morbidity, mortality, and hospitalization rates (3,4). Overall, anemia in CKD patients leads to a poor quality of life, with a decrease in physical activity (5), congestive heart failure, and decreased cognition and mental acuity (6–10). Erythropoiesis-stimulating agents (ESAs) are considered the standard of care for the treatment of patients with anemia associated with CKD (11–13). Epoetin alfa (EPO) is an ESA with an amino acid sequence identical to endogenous human erythropoietin (14). Previous studies have suggested that extended-interval dosing of EPO could treat anemia in CKD patients not on dialysis (15–21). In a recent randomized, open-label, multicenter study (22), we demonstrated that once-weekly (QW) and every 2 weeks (Q2W) regimens of EPO could be used as potential alternatives to the approved three times weekly dosing for the treatment of anemia in ESA-naïve subjects with stage 3 to 4 CKD (22). The purpose of this study was to determine whether Q2W and every 4 weeks (Q4W) extended-interval dosing regimens would be as safe and effective as QW dosing for maintenance of hemoglobin (Hb) levels in subjects with stage 3 to 4 CKD. This was a randomized, open-label, multicenter study conducted according to the Declaration of Helsinki, the International Conference on Harmonisation, and the Guidelines for Good Clinical Practice at 53 sites in the United States between June 2007 and March 2009. The study protocol and amendments were reviewed and approved by an Institutional Review Board, and subjects provided their written consent to participate in the study. The study population was composed of subjects >18 years of age with anemia associated with CKD (defined as GFR ≥15 ml/min per 1.73 m2 and <60 ml/min per 1.73 m2) who had an Hb level 10.0 to 11.9 g/dl, inclusive, on two measurements in the 4 weeks before randomization and confirmed at the randomization visit, while on a stable QW dose of EPO. Key exclusion criteria included: iron deficiency, with serum ferritin concentration <50 ng/ml and transferrin saturation <20%; poorly controlled hypertension; severe congestive heart failure or coronary artery disease; deep venous thrombosis or pulmonary embolus within the prior 12 months; stroke, transient ischemic attack, acute coronary syndrome, or other arterial thrombosis within the prior 6 months; and dialysis or anticipated to require dialysis during the study. The study consisted of three phases: a 2-week screening phase, a 36-week, open-label treatment phase (which consisted of conversion and maintenance treatment), and a 4-week post-treatment phase (which consisted of a completion (or early withdrawal) visit and a follow-up contact). Subjects who were already maintained on a stable QW dose of EPO were randomly assigned in a 1:1:2 ratio to receive subcutaneously EPO (Procrit®; Ortho Biotech Products LP, Raritan, NJ) QW, Q2W, or Q4W. For the QW group, the starting dose was the same as the last prerandomization dose of EPO therapy. For Q2W, the starting dose was two times the last QW prerandomization dose, rounded up to the nearest 10,000 IU. For Q4W, the starting dose was four times the last prerandomization QW dose, rounded up to the nearest 20,000 IU. To be eligible for randomization, subjects were required to have two Hb concentrations between 10.0 and 11.9 g/dl, inclusive, taken at least 1 week apart during the 4 weeks before randomization, and confirmed at the week 1 (randomization) visit, while on a stable weekly dose of EPO. Sites were provided with a HemoCue® point of care device to measure Hb, and doses were administered within 24 hours of Hb determination. For consistency of analysis, the baseline Hb value at the week 1 randomization visit and all subsequent weekly Hb values were obtained at the site using the HemoCue® System. These measurements were used for all Hb analyses and prevented any bias that might have been introduced by the use of different laboratories. This study was designed as an open-label study, in part because a double-blind design would have required that all subjects enrolled in the study receive injections every week, causing undue hardship. Any potential for bias was eliminated by the design of the study: the primary and secondary endpoints were calculated on the basis of laboratory values (Hb), and all doses were generated by a dosing algorithm that was programmed into the interactive voice response system to target an Hb level 11.0 to 11.9 g/dl, inclusive. The investigators did not calculate any doses. The endpoints were not influenced by open-label treatment. Study drug was withheld if the Hb levels exceeded 11.9 g/dl or if the Hb rate of rise was ≥1.5 g/dl in the prior 2 weeks. The dose was reduced if the Hb rate of rise was ≥1.0 but <1.5 g/dl in the prior 2 weeks, and the dose was increased if the Hb level was ≤10.5 g/dl with an Hb rate of rise of <0.5 g/dl in the prior 2 weeks. Study drug dose was increased or decreased by 25% of the subject's initial dose no more frequently than every 4 weeks. The protocol-specified maximum dose was 20,000 IU for QW, 40,000 IU for Q2W, and 80,000 IU for Q4W. Subjects were to be withdrawn from the study if Hb was <10.0 g/dl for two consecutive weeks at least 4 weeks after receiving the maximum dose. Any subject who started renal replacement therapy continued in the study but was withdrawn from treatment. Data collected after the start of renal replacement therapy were not included in the primary analyses. Iron therapy was strongly recommended to keep the transferrin saturation (TSAT) >20%. The TSAT and serum ferritin were measured at screening and every 4 weeks while on study. Oral iron supplements were provided to the investigators for distribution to the subjects. Treatment with parenteral iron was permitted. Venous blood samples were collected at the study site at screening and weekly thereafter through week 36 in all groups. The Hb values were measured by the HemoCue® Hb 201+ System. Transfusion information was recorded from screening through week 36. The following safety parameters were assessed weekly: adverse events (AEs), including serious AEs (SAEs), thromboembolic vascular events (TVEs), and new onset or worsening of hypertension, and vital sign measurements. Physical examinations were conducted, and serum erythropoietin antibodies were measured at screening, completion/early withdrawal, predialysis, and in the evaluation of an unexpected decrease in Hb levels. Clinical laboratory parameters were measured every 4 weeks. The primary objective of this study was to demonstrate that Q2W and Q4W treatment with EPO in subjects with anemia associated with CKD was noninferior to QW treatment with respect to the mean change in Hb from baseline to the average of the last 12 weeks of treatment. The secondary efficacy endpoint was the proportion of weeks per subject in which the Hb concentration was between 10.0 and 11.9 g/dl, inclusive, during weeks 13 to 37. Safety parameters included Hb-related endpoints (Hb >11.9 g/dl and rapid rate of Hb rise over any 2-week period) and clinical safety endpoints. 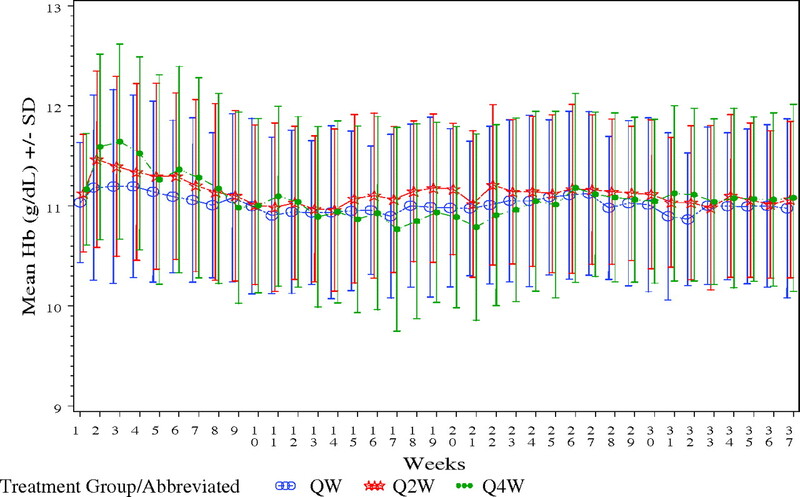 For comparisons of the mean change in Hb from baseline to the average of the last 12 weeks of treatment between QW and Q2W and between QW and Q4W, an estimate of the difference in means (Q2W minus QW, and Q4W minus QW) was computed along with the two-sided 95% confidence interval (95% CI) for the difference. The estimate of the difference and the CI were calculated using an analysis of covariance (ANCOVA) model, with baseline Hb as a covariate. The two comparisons were tested in a stepdown manner. First, Q2W dosing was declared noninferior to QW dosing if the lower limit of the CI for the difference was more than −1 g/dl. If Q2W was found to be noninferior to QW, Q4W was tested against QW. If the lower limit of the CI for the difference for the Q4W minus the QW was more than −1 g/dl, Q4W was declared noninferior to QW. Primary and secondary efficacy endpoints were analyzed using the modified intention to treat population (defined as all randomized subjects who had one or more postrandomization Hb measurements); safety endpoints were analyzed using the safety population (defined as all randomized subjects who received at least one injection of study drug). The per-protocol population was defined as all randomized subjects who received ≥75% of the intended doses before withdrawal from the study or initiation of dialysis, whichever occurred earliest, and who had no major protocol violations. The per-protocol population was used in a sensitivity analysis for all efficacy and the Hb-related safety endpoints. Summary statistics for the proportion of weeks per subject in which the Hb concentration was between 10.0 and 11.9 g/dl, inclusive, during weeks 13 to 37 were generated for each treatment group. Safety data, including AEs, clinical laboratory test results, vital sign measurements, and results of serum erythropoietin antibody testing, were summarized. 430 subjects were randomized to one of three treatment groups: QW, Q2W, and Q4W, (n = 108, 107, and 215, respectively) (Figure 1). Demographic and baseline characteristics were generally well balanced among the three treatment groups (Table 1). The median age was 72.0 years, the median GFR was 26.0 ml/min per 1.73 m2, and 62% were women. The mean Hb concentrations at baseline were 11.0, 11.1, and 11.2 g/dl for the QW, Q2W, and Q4W groups, respectively. The prestudy mean weekly EPO doses were 5503 IU in QW, 6348 IU in Q2W, and 5991 IU in the Q4W groups. Subject disposition. ITT, intent to treat; mITT, modified ITT; mITT populationa, subjects who were randomized and had at least one postrandomization Hb value; Per-protocol populationb, subjects who received at least 75% of the intended doses before withdrawal from the study or initiation of dialysis, whichever occurred earlier, and who had no major protocol deviations. The median weekly dose over the study treatment period was 2967 IU in the QW, 4529 IU in the Q2W, and 5423 IU in the Q4W groups. The median weekly dose increased substantially as the dosing interval increased, but it remained moderate even for the most extended dosing interval. The frequencies of dose increases and decreases were low and comparable across the three treatment groups. For the QW, Q2W, and Q4W groups, the median number of dose increases was two, one, and one; the median number of dose decreases was two, two, and two, respectively. Both the Q2W and Q4W EPO dosing regimens were noninferior to the QW dosing regimen in terms of the mean change in Hb concentration from baseline to the average of the last 12 weeks of treatment. The estimated difference between the Q2W and QW groups was −0.03 g/dl (95% CI: −0.21, 0.15) and between the Q4W and QW groups was −0.09 g/dl (95% CI: −0.25, 0.06) (Table 2). The lower limit of the 95% CI for the estimated treatment difference for both comparisons, Q2W versus QW, and Q4W versus QW, was above the prespecified noninferiority margin of −1 g/dl. These analyses were adjusted for the baseline Hb level. These results appear robust because sensitivity analyses on the basis of the per-protocol population and ANCOVA models adjusted for both baseline Hb level and study center demonstrated similar findings. Hb levels over time are shown in Figure 2. The early increases in Hb in the Q2W and Q4W groups are likely due to the rounding up of the initial dose in these two groups. Mean final Hb levels (average of Hb in last 12 weeks) were 11.0 g/dl in all three treatment groups. A total of 11 subjects met the Hb withdrawal criteria: 0 (0%) in QW, 4 (3.7%) in Q2W, and 7 (3.3%) in the Q4W groups. Hb concentrations were maintained between 10.0 and 11.9 g/dl, inclusive, for a substantial (75% or greater) proportion of weeks per subject for all three treatment groups during weeks 13 to 37, with a slightly smaller proportion seen in the Q4W group (Table 3). From weeks 13 to 37, the mean percentage of weeks per subject with Hb level 10.0 to 11.9 g/dl, inclusive, was 81% for QW, 81% for Q2W, and 75% for Q4W. Mean Hb during weeks 1 to 37 of treatment by EPO treatment groups. A total of 24 subjects (5.6%) received transfusions (3.7% in the QW group, 5.7% in the Q2W group, and 6.5% in the Q4W group). The majority (20 subjects) received transfusions for an acute decrease in Hb associated with hospitalization for an intercurrent medical illness or surgical procedure. The number of subjects who received iron supplementation was comparable in the three treatment groups, as well as serum ferritin and TSAT at screening and at the completion of the treatment. The mean TSAT at screening was 24.7% for QW, 25.4% for Q2W, and 24.8% for Q4W. At the end of trial visit, the TSAT was 25.4% in QW, 26.9% in Q2W, and 30.9% in Q4W. The mean ferritin level at screening was 514 ng/ml for QW, 519 ng/ml for Q2W, and 559 ng/ml for Q4W. At the end of trial visit, the values were 639 ng/ml for QW, 657 ng/ml for Q2W, and 743 ng/ml for Q4W. These values are in concordance with the National Kidney Foundation-Kidney Disease Outcomes Quality Initiative Practice Guidelines that recommend maintaining ferritin ≥100 ng/ml and TSAT ≥20% to ensure adequate availability of iron for erythropoiesis among patients with CKD. The proportion of subjects with Hb ≥11.9 g/dl (the threshold for withholding a dose) was 74%, 85%, and 75% in the QW, Q2W, and Q4W groups, respectively. The median per-subject frequency of Hb ≥11.9 g/dl was two times for the QW group compared with three times for the Q2W and Q4W groups. The mean maximum Hb was comparable across the three treatment groups: 12.4, 12.5, and 12.5, respectively, in the QW, Q2W, and Q4W groups. The proportion of subjects who experienced an Hb rate of rise ≥2 g/dl in any 2-week period was 34.6%, 31.4%, and 31.6%, respectively, in the QW, Q2W, and Q4W groups. The mean maximum Hb rate of rise was 1.8, 1.7, and 1.8 g/dl in the QW, Q2W, and Q4W groups, respectively. A summary of clinical safety events is provided in Table 4. The incidence of AEs was comparable among the three treatment groups. Discontinuation from the study because of an AE was low for all three treatment groups, with no single AE leading to study discontinuation for more than 1% of subjects in any treatment group. The most commonly reported treatment-emergent AEs during the study were hypertension (11% of subjects), urinary tract infection (8% of subjects), edema (8% of subjects), and hyperkalemia (8% of subjects), which are typical events for patients with CKD. There was no consistent pattern emerging across the dosing groups with respect to the rates of adverse events. SAEs occurred in 22%, 26%, and 26% of subjects in the QW, Q2W, and Q4W groups, respectively. The most commonly reported SAEs were congestive heart failure (4% of subjects), acute renal failure (3% of subjects), chest pain (2% of subjects), and anemia (2% of subjects). No clear relationship was observed between mean weekly Hb level and number of SAEs for any of the three treatment groups. Initiation of dialysis was low and comparable across dosing groups (2% of subjects in each of the three treatment groups). 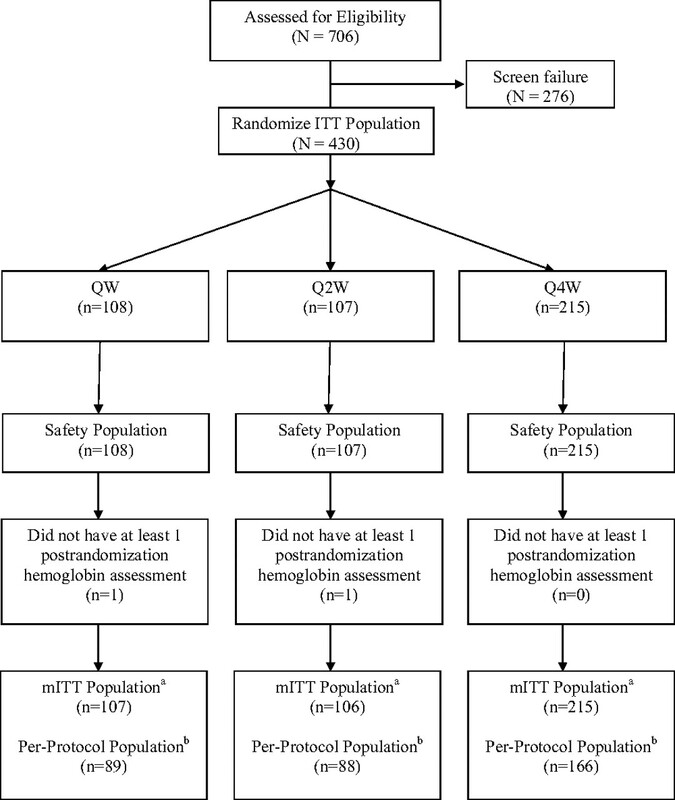 The proportion of subjects with investigator-confirmed TVEs was low across the three treatment groups (3% in QW, 5% in Q2W, and 3% in the Q4W groups). No clear relationship was observed between mean weekly Hb level and number of TVEs for any of the three treatment groups. The incidence of treatment-emergent hypertension was low and comparable across the three treatment groups: 12%, 13%, and 12% of subjects in the QW, Q2W, and Q4W groups, respectively. Approximately 4% of subjects died during the study: 4% in QW, 3% in Q2W, and 4% in the Q4W groups. The individual subject causes of death are listed in Table 5. Over the entire study, no subject had a positive test for epoetin antibody, and no subject underwent a renal transplantation. The results of this randomized, controlled study demonstrate that both the Q2W and Q4W extended-interval dosing regimens of EPO were not inferior to the QW dosing regimen with respect to the mean change in Hb from baseline to the final Hb, and they confirm the results of previous studies of extended-interval dosing of EPO for correction of anemia and maintenance of Hb in the CKD patient population (15,17,19–21). The Hb concentrations were maintained between 10.0 and 11.9 g/dl, inclusive, for a substantial (75% or greater) proportion of weeks per subject for all three treatment groups during weeks 13 to 37. The need for transfusion was low overall, and most transfusions were administered for an acute decrease in Hb that developed while subjects were hospitalized for an intercurrent medical illness or surgical procedure. The incidence of treatment-emergent AEs, discontinuation from the study because of AEs, and death were generally comparable among treatment groups. Most deaths were likely due to comorbidities typical of the elderly CKD population under study (Table 5). No additional subjects died during the follow-up period after commencement of dialysis. The incidence of treatment-emergent SAEs was slightly higher in the Q2W and Q4W groups compared with the QW group. However, the frequency and types of SAEs did not suggest a pattern related to extended-interval dosing. There has been concern that ESAs may cause an increase in BP. However, in this study there were no clinically meaningful changes observed in mean systolic or diastolic BP over time in any of the treatment groups. The incidence of treatment-emergent hypertension was infrequent and virtually identical across the three treatment groups. An increased risk of TVEs has been reported in some patient populations treated with ESAs (23,24). In this study, the incidence of TVEs was low, despite the fact that many subjects had multiple preexisting risk factors (age, diabetes mellitus, hypertension, hypercholesterolemia, obesity, and prior history of vascular events). The incidence of TVEs was distributed across the dosing groups and did not appear to be related to Hb level, Hb rate of rise, EPO dose, or dosing interval. The number of dose increases and dose decreases was low and comparable across the three treatment groups. The QW group experienced a greater number of doses withheld compared with the Q2W and Q4W groups. This difference is largely explained by the greater frequency of dosing in the QW group, and also by the dosing algorithm, which permitted dose increases and decreases only every 4 weeks but dose withholds at every dose administration. The median weekly dose for the Q4W group was higher than in the QW and Q2W groups. Because the pharmacodynamic effect of an ESA is more related to the half-life of the circulating red cell than to the pharmacokinetic properties of the drug, one would not necessarily expect the dose to increase by 2- or 4-fold when one increases the dosing interval. This finding suggests that as the dosing interval is extended, a higher dose of EPO is required to achieve the same Hb effect, and this is consistent with prior studies of EPO administered at extended dosing intervals (15,19,20). In sum, this study supports Q2W and Q4W dosing of EPO to maintain Hb levels within the therapeutic range. In conclusion, these results extend the findings of the companion study (22) that compared QW and Q2W to three times weekly dosing of EPO for correction of anemia and maintenance of Hb in subjects with stage 3 to 4 CKD. As the dosing interval is extended beyond QW, the dose requirements increase and a small proportion of subjects do not maintain adequate Hb levels. However, for a substantial majority of subjects, the Hb was adequately maintained when dosing was extended from QW to Q2W and Q4W. G.G., M.F., S.S., and P.B. are employees of Johnson & Johnson Pharmaceutical Research & Development LLC and own stock in Johnson & Johnson. M.W. is an employee of Centocor Ortho Biotech Services LLC and owns stock in Johnson & Johnson. P.E.P. has received research support from Johnson & Johnson Pharmaceutical Research & Development LLC. The authors thank Denise Okonsky for assistance with the conduct of the study, Agnes Li for data programming, and Namit Ghildyal for assistance in the preparation of the manuscript. This work was supported by Johnson & Johnson Pharmaceutical Research & Development LLC. Results from this study were presented in part (Abstract F-PO2052) at the American Society of Nephrology Renal Week, October 27 to November 1, 2009, San Diego, CA. This trial has been registered at www.clinicaltrials.gov (identifier NCT00440466). The following investigators (listed in alphabetical order) participated in the EPO-AKD-3002 study: I. Aisiku, MD, Medical Research Initiatives, Richmond, VA; M. Akmal, MD, DaVita/USC Kidney Center, Los Angeles, CA; A. Ashfaq, MD, North Shore University Hospital Division of Nephrology & Hypertension, Great Neck, NY; O. Ayodeji, MD, MPH, Peninsula Kidney Associates, Hampton, VA; D. Belo, MD, CA Institute of Renal Research, Chula Vista, CA; R. Benz, MD, Nephrology Associates Lankenau Hospital, Wynnewood, PA; M. Bernardo, MD, Southwest Houston Research Ltd., Houston, TX; S. J. Buerkert, MD, Columbia Nephrology Associates, Columbia SC; C. Christiano, MD, East Carolina University Nephrology and Hypertension, Greenville, NC; E. Clark, MD, Regional Kidney Disease Center, Erie, PA; W. Cleveland, MD, Southwest Atlanta Nephrology, Atlanta, GA; R. Cottiero, MD, Hypertension and Nephrology, Providence, RI; D. Coyne, MD, Washington University School of Medicine, St. Louis, MO; P. Crawford, MD, Research by Design LLC, Evergreen Park, IL; H. Cremisi, Southeast Renal Research Institute, Monroe, NC; N. Daboul, MD, Advanced Medical Research, Maumee, OH; A. Dauer, MD, Tower Nephrology Medical Group, Los Angeles, CA; P. Denker, MD, Gulf Coast Endocrine and Diabetes Center, Clearwater, FL; S. Digiovanni, MD, Virginia Commonwealth University, Richmond, VA; M. Germain, MD, Western New England Renal & Transplant, Springfield, MA; D. Gillum, MD, Western Nephrology and Metabolic Bone Disease PC, Lakewood, CO; T. Griffith, MD, Metrolina Nephrology Associates PA, Charlotte, NC; S. Hood, MD, Merrimack Valley Nephrology, Pentucket Medical Associates, Methuen, MA; P. Lazowski, MD, Plymouth, MA; J. Lee, MD, Apex Research of Riverside, Riverside, CA; S. Mayeda, MD, The Endocrine Medical Group Inc., Orange, CA; B. Mehta, MD, Arlington Nephrology, PA, Arlington, TX; I. Meisels, MD, St. Luke's-Roosevelt Hospital, New York, NY; C. Mere, MD, Howard University Hospital, Washington, DC; P. Modlinger, MD, Clinical Research & Consulting Center LLC, Fairfax, VA; M. Moustafa, MD, SC Nephrology & Hypertension Center Inc., Orangeburg, SC; M. Nassri, MD, Palmetto Nephrology, Orangeburg, SC; J. Navarro, MD, Genesis Clinical Research, Tampa, FL; V. Patel, MD, Florida Medical Clinic Nephrology Division, Zephyrhills, FL; P. Pergola, MD, PhD, Renal Associates PA, San Antonio, TX; J. Regimbal, MD, Internal Medicine Northwest, Tacoma, WA; C. Rodenberger, MD, Hypertension and Kidney Specialists, Lancaster, PA; S. Sader, MD, RenalCare Associates, Peoria, IL; R. Sankaram, MD, R. Sankaram, MD, Inc., Fountain Valley, TX; D. Scott, MD, Clinical Research Development Associates LLC, Springfield Gardens, NY; P. Suchinda, MD, Carolina Diabetes and Kidney Center, Sumter, SC; F. Trespalacious Nephrology Associates of South Miami, Miami, FL; P. Turer, MD, Mid Atlantic Nephrology Associates PA, Baltimore, MD; F. Varghese, MD, Diagnostic Clinic of Houston, Houston, TX; M. Waseem, MD, Baltimore, MD; R. Weiss, MD, West Palm Beach, FL; and R. Zabaneh, Northwest Louisiana Nephrology Research, Shreveport, LA.